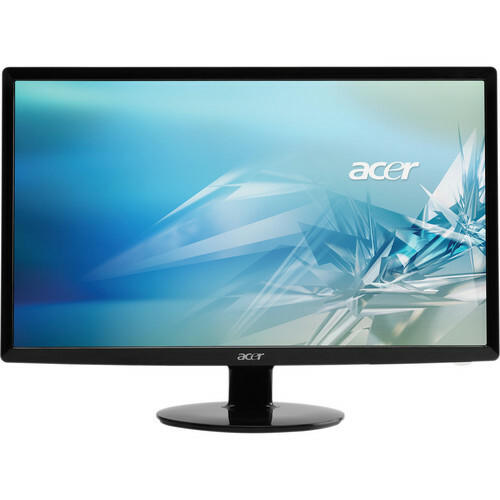 The S231HL bid 23" Widescreen LED Backlit LCD Monitor from Acer is a desktop computer monitor with a white LED backlight. LED technology delivers superior image quality and reduced power consumption when compared to traditional CCFL displays. The display features a 16:9 aspect ratio and a native resolution of 1920 x 1080 -- equal to that of 1080p video. It also boasts a 12,000,000:1 dynamic contrast ratio, 250cd/m² brightness rating, 5ms response time, support for 16.7 million colors, and 170°/160° viewing angles. It can connect to a computer via VGA, DVI, or HDMI. S231HL bid 23" Widescreen LED Backlit LCD Monitor is rated 4.5 out of 5 by 4. Rated 5 out of 5 by Anonymous from Bang for the Buck Great monitor. I use this daily for multiple hours and never get tired. You can change the screen setting from gaming, reading, normal, etc...The main difference is the light intensity. I have it set to text which is as bright as I would want to go. Low glare as I have this set up in a room with windows on three sides. The LED was defiantly worth the extra price. One of the few monitors that sends you all three input cables with it, a definite plus. Rated 4 out of 5 by Cody from Great product for the price Hard to beat this monitor for the price. It is very light and has lots of connectivity (dvi, hdmi, vga). My only complaint is that it is a little washed out at first and needs a calibration. However thats true of almost all monitors so not a big deal. I would buy another one if I had the desk space. Rated 5 out of 5 by Anonymous from Easy on the eyes and the wallet I feel that these equal or beat the 24 Mac display. I picked up two of them with my new Mac Pro and so far they are exactly what I want for exactly the right price. They are light and easy to set up and they come with all cables to include the HDMI. Rated 4 out of 5 by S. King from Great Price Great Monitor Good Clean Monitor. Price can't be beat. Size is wonderful. Color management could be better, but for the price I expect that.